I managed to develop, not a thick skin at all, but a kind of… well, something very useful, and I don’t really know how to describe it, but it’s like distancing yourself from something that is really deeply unpleasant, but going through it. This is an experience which I cannot avoid. I cannot walk away from it. Whatever happens, I have to go through it, so I will make it as easy for myself as I can. In other words, when this man is shouting at me and his face is purple and I’m getting his spittle all over my face, and he’s calling me a poofter and a God-knows-what, I’m fine. This isn’t really happening, this isn’t really important. It really isn’t important. And the same thing happened with bayonet practice, because there you… and 50 yards away, you have a sack of straw hanging from a gallows, and you have your bayonet mounted on your rifle, and at a given moment your training officer, your lance corporal or corporal, whatever he may be, tells you, 'Go', and you go, and you’re supposed to go screaming, you know, screaming with a noise which is supposed to frighten the enemy. Your're not screaming with your own fright. And then you have to dig the bayonet into the thing, and then you have to pull it out again. And if you do it in the wrong place, because you think, you know, fool that you are, that you’re going for the ribcage, for the heart, but then it is demonstrated that by the time you’ve stuck your bayonet through the ribcage, you’re going to find it bloody difficult to get out again. Meanwhile, some Russian or German or Chinese or God-knows-what is going to shoot you. So you must stick it into the soft parts, because it comes out as quickly as it goes in. And we have to absorb all this and go along with it, and my rather active Christian background is saying, 'No, no, you can’t ever…' and my common sense is saying, 'You’re not really doing it. The time to have this argument with yourself is when you are actually doing it, not now'. And that, I think, was my saving device for getting through whatever the army made me do: it isn’t really happening. It’s happening, I know. Here am I, on my knees, scraping the crystalline deposits of the urine of a hundred young men from this urinal with half a razor blade and bare hands. I am scraping. Of course I’m really doing it, and I’m going to do it really rather well, so that I don’t have to do it again. But it’s not important. It’s unpleasant, but it is not important. It doesn’t change my soul. It has nothing to do with me. So it’s not important, don’t worry about it. That, I think, is what got me through. 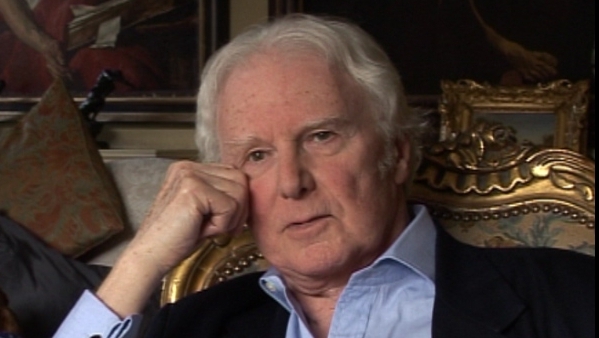 Born in England, Brian Sewell (1931-2015) was considered to be one of Britain’s most prominent and outspoken art critics. He was educated at the Courtauld Institute of Art and subsequently became an art critic for the London Evening Standard; he received numerous awards for his work in journalism. Sewell also presented several television documentaries, including an arts travelogue called The Naked Pilgrim in 2003. He talked candidly about the prejudice he endured because of his sexuality.